You can buy battery operated cocking devices but they are expensive. A rifle like a 243 will have far more power, range and accuracy than any bow. I am a senior 6' tall with strong hands and a rifleman of over 60 years experience. 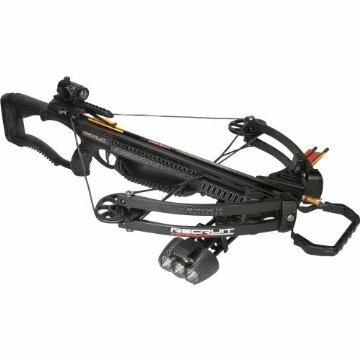 I like the new to me crossbow as my state made them ok now for deer. I like playing with it in my basement and I shoot it every week down there. Even a reduced load in a 243 would be much easier to hit with however the crossbow is fun. You can try both. Last edited by Savage_99; 02-22-2017 at 08:25 AM. Did you ever consider putting a muzzle break on your existing rifles? That would reduce a lot of recoil. Also add a quality recoil pad. My Barnett Recruit Recurve crossbow just got jammed here with the string back and I tried a practice shot in the basement. Something jammed in it's trigger mechanism. I forced a part of the trigger with a large screw driver and was able to shoot an arrow off to 'unload' it's string. Last edited by Savage_99; 04-23-2017 at 08:33 PM.